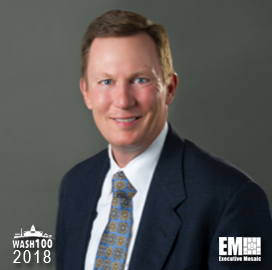 ExecutiveBiz recently spoke with Doug Lane, president and chief executive officer, and a 2018 Wash100 winner, about Capgemini Government Solutions’ service offerings and how he is positioning his company for success in the 2018 federal marketplace. ExecutiveBiz: You have over 30 years’ experience driving technology transformation in both the public and private sector. How has your background helped prepare you to lead Capgemini Government Solutions as president and CEO? Doug Lane: About two thirds of my career was spent supporting private sector clients across a wide array of industries, and the last third has been spent supporting government clients. All of it has focused on helping clients leverage technology to improve their business operations or to better fulfill their missions. Over the years, I’ve had great mentors and coaches that helped me develop not just as a consultant, but also as a professional building and leading services businesses. Because of that, I spend a great deal of time developing our most senior talent and driving an apprenticeship culture to develop the next generation of leaders. This means ensuring Capgemini’s global capabilities are readily available to them, so when they work with their teams and clients they can deliver the most value to those organizations. ExecutiveBiz: Capgemini Government Solutions specializes in federal IT services and digital transformation. What allows Capgemini to offer simplicity and agile acquisitions solutions? Doug Lane: Within our U.S. government solutions business, we’ve simplified our business processes and pushed the decision-making authority down to our market teams, who are closest to our clients and teaming partners. This enables acquisitions to occur more naturally, without multiple approval gates. I know it’s working because we get compliments all the time from our clients about how responsive we are compared to our competitors in terms of timeliness and quality. For the few things that require more of a corporate commitment, or fall outside of the market teams’ authority, we have a very connected, well-informed senior management team that turns around decisions quickly. Throughout our business we instill a culture where decision-making is centered around what’s best for the client, rather than what’s best for the organization or individual. When you do that, decisions flow naturally. ExecutiveBiz: What new projects are on the horizon for Capgemini? Doug Lane: We have over a dozen innovation centers around the world (in the U.S., they’re located in New York city and San Francisco), connected to every major public and private sector innovation cluster including academia and the startup community. We leverage the intellectual capital and experience gained from these centers to anticipate problems before they happen. This entails working with these communities on things we think will be of interest to our clients, as well as working with clients individually on problems they bring to us. Often the projects revolve around physical technology, but not always. Relying on this global network allows us to offer our clients incubated, tested solutions at scale, which is unique in the U.S. federal marketplace. ExecutiveBiz: As federal agencies continue to embrace and migrate to the cloud, how do you see this presenting opportunities in 2018? Doug Lane: We see agencies requesting a range of cloud migration plans, everything from mass migrations, where they quickly and completely shut down data centers, to offerings centered on the project planning process. Federal clients largely look at hybrid cloud approaches, so they don’t migrate their mission critical systems in order to avoid vendor lock-in. Since Capgemini has conducted over 5,000 cloud projects globally, we’ve developed a rich experience of cloud migration best practices and industrialized the assessment offerings. As an example, we have an application programming interface-led transformation where we integrate on-premise systems with cloud service providers. Our goal is to help large global organizations share data efficiently and effectively across computing environments. ExecutiveBiz: Where do you see Capgemini Government Solutions driving the most value in 2018? Doug Lane: The passage of the Modernizing Government Technology Act of 2017 accelerated agencies upgrading their older systems and taking advantage of newer technologies, so we see opportunities across the market. That said, we try to stay closer to clients we have existing relationships with and try not to do all things for all people. We have a deep set of partnerships with companies like SAP, Oracle, MuleSoft, Microsoft, Salesforce and Amazon Web Services, among others. In our financial services practice, whether with MuleSoft or Pegasystems or others, we often come across products that haven’t seen a lot of exposure in the federal space. Connecting these experts in high-transaction processing areas with government agencies is a service we provide and a great way to deliver for our clients. Doug Lane has been president and CEO of Capgemini Government Solutions since 2014. Before that, he served as a senior vice president at Booz Allen Hamilton, where he led sales and IT service delivery for the infrastructure markets, and enterprise resource planning.